I was watching it this Sunday past for the 100th time when I suddenly remembered I had to give Moshe Moshi a bath and a nail trim, but first, we had to dance. 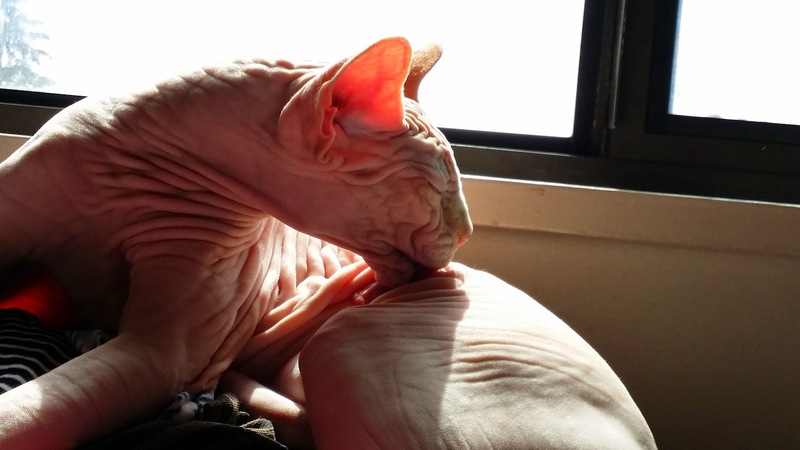 A part of healthy, naked cat care is regular bathing. It’s not enough to just depend on the cat to groom itself. The hair on any animal (people included) protects the body. Since people through evolution have lost their primate body hair, it becomes necessary to remove dirt by bathing. It's the same for the naked cats. A cat’s habit of licking the hair or skin is not so much about cleanliness as it is the cat’s way of regulating body temperature. Think about it; do you say you would be clean if you licked your skin? There is nothing different in Cat saliva that is any more germ-killing than yours. If you believe you can lick and stay clean, remember to stay downwind from me. Get your cat accustom to having its toes/paws touched. Taking your cat to the Vet just to get a nail trim can be expensive and traumatizing. Use a non-abrasive soap when cleaning the paws. You don’t want to damage the skin. Rinse your cat’s feet and nails thoroughly after washing, exposing the nail beds when you do. You don’t want the cat to ingest cleaning solution even if it is cat-friendly. Make sure your cat’s feet dry after bathing to eliminate moisture. 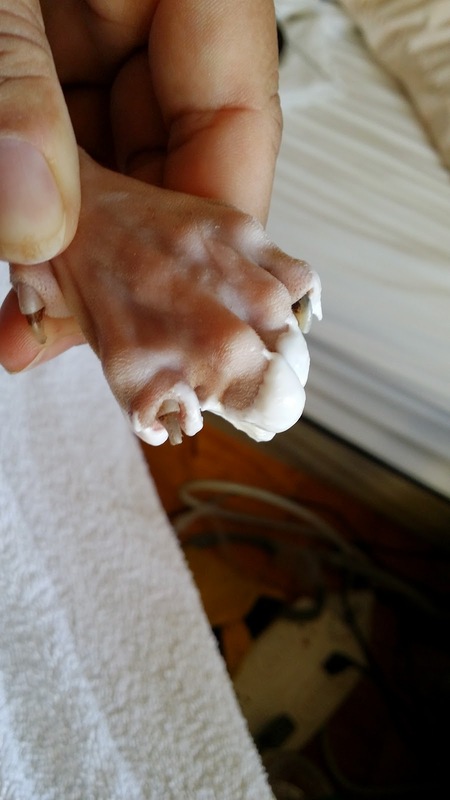 If you ask any two sphynx owners how they clean their cat’s feet, more than likely you will not get the same answer. Though all agree on the key points, everyone’s method is different. 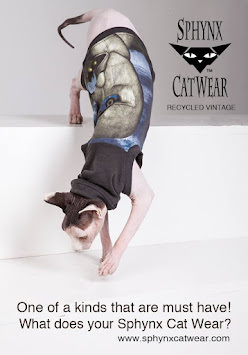 My dear friend, Teri of the famed FurryDance Cattery, blogs Curlz & Swirlz and Coco the Couture Cat was a breeder and owner of Cornish Rex and Sphynx cats for 22 years. She lets her cat’s feet soak while she baths them and then uses Stridex pads to clean nail beds, rinses feet again and then dries. You can look at all of Teri’s cats and see that the method works well for her. I on the other hand rub Moshe Moshi’s feet with Ponds Cold Cream for about 5 minutes then soak and wash his feet. I then use a warm, damp cosmetic cotton wipe to remove remaining dirt and any cold cream. I also can cut his nails as I go along. A soft nail has less splitting when cutting. I go back over the toes with a dry cosmetic cotton wipe, done. I know that some people depend on dish soap like Dawn or Palmolive to clean feet. Those two brands are easier on the skin than most dish liquids, but though it’s okay for your cat’s feet, you should not use it for bathing your cat. There are products on the market that do a safe job of bathing your cat. I will do a post on general bathing later. If you do use any non-pet product on any part of the body, you do want to make sure you adequately rinse all soap from your cat’s feet and body since most cats will lick or chew themselves after bathing. I tried to get a good picture of Moshe Moshi's toes, but all he wanted to do is play, which given what I put him through ain’t so bad.